Mustangs senior will play college basketball at the University of Maine at Augusta. Kaeti Butterfield may not have ended her high school basketball career the way she had hoped, but her future in the sport is bright. 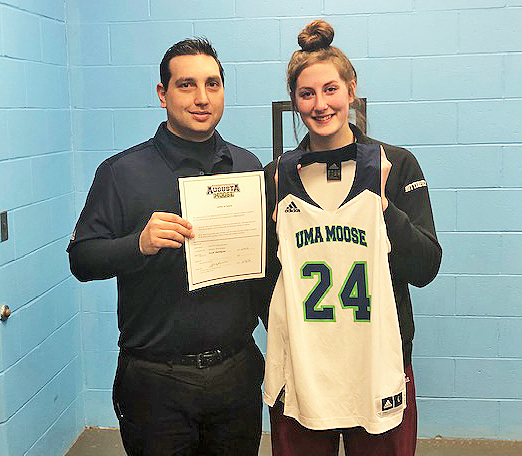 Immediately following her team’s 52-35 loss to North Yarmouth Academy in the Class C South quarterfinals Tuesday morning, the Monmouth Academy senior signed her letter of intent to play basketball next season at the University of Maine at Augusta. Butterfield signed her letter in the team’s locker room at the Augusta Civic Center, joined by UMA women’s basketball coach Alex Stern and former UMA head coach Jennifer Lainey, who is the school’s athletic director. Stern, who has been at the Civic Center scouting the tournament throughout the week, said Butterfield will be an excellent fit for the Moose. 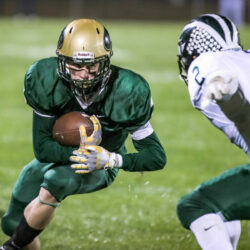 Butterfield will be a part of Stern’s first recruiting class at UMA. He took over the program right before the season, inheriting a young team full of Lainey’s previous recruits. Despite the quick adjustment period needed between Stern and his players, the Moose wrapped up the season Sunday with a 10-15 record, including a 77-75 upset victory in overtime over Thomas College on Dec. 4 in Waterville. Stern believes Butterfield’s versatility will mesh well with his up-tempo style of play.